It’s easy to get outraged by world events, frustrated by our own personal battles, and disenfranchised from government and leadership. Born of moral indignation, informed by decades of study, and seasoned by a life of devoted self-cultivation, Monk Yun Rou’s Mad Monk Manifesto has the answers we’re looking for, organically cohering personal prescriptions and calls to social and political action in one powerful document. 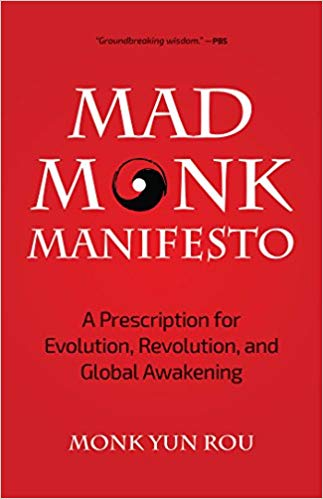 Based on ancient Chinese wisdom such as Lao Tzu’s Tao Te Ching, Mad Monk Manifestois part tour guide to consciousness, part recipe for personal development, part prescription for environmental salvation, and part handbook for social change. In the same way ripples move away from a stone dropped into a pond, Mad Monk Manifesto begins with our personal lives, discussing topics such as diet, exercise, meditation, and mind/body practice, and spreads to our public environment, describing ideas such as what we can do to improve the community, the government, and the world. Inspirational and informative, exhortative and prescriptive, this modern Alan Watts creates a complete and immersive experience for everyone who picks up his Mad Monk Manifesto. Emerge with a new way of seeing life, a series of concrete steps to take for personal transformation, and an action plan for working in the community to provoke change. Visit https://monkyunrou.com/ for more information. This entry was posted in Award, celebrity, honoree, India, Recognition and tagged author, Monk, Today's Honoree, Yun Rou. Bookmark the permalink.